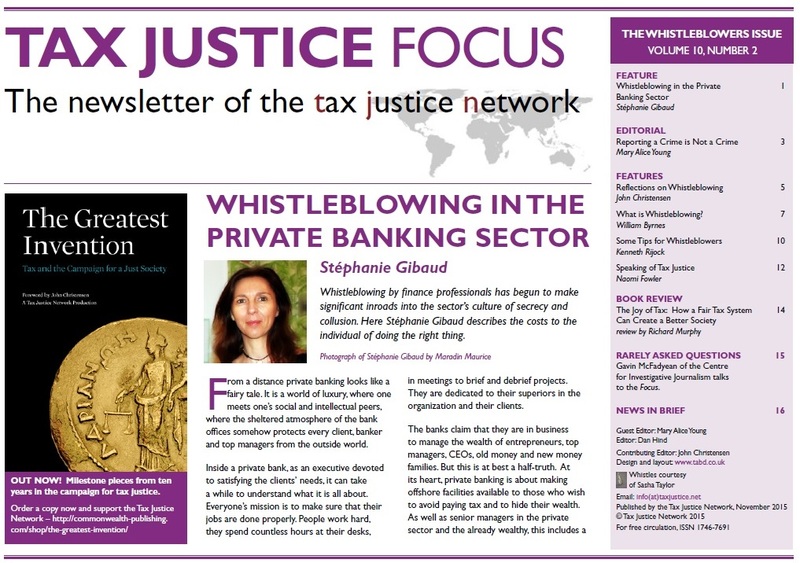 The latest edition of our newsletter Tax Justice Focus, with a special focus on whistleblowers, is now available for download here. Guest edited by Mary Alice Young of the University of the West of England, this edition is both an exploration of the difficulties confronting people who want to blow the whistle on companies engaged in providing financial services, and an acknowledgment of their personal courage. ” . . when one understands that there is something wrong with private banking – in effect, offshore banking, blowing the whistle internally or externally can feel like committing suicide: a quick death or a long and painful one, but the end of a certain kind of life, nonetheless.
. . . the so-called privileged elite is extremely well organized and is united when it comes to defending their own interests. Private banking is one part, an important part, of this organization in defence of privilege. Stephanie Gibaud reflects on her experience in private banking and explores the reality of what happens once someone decides to speak out about unethical or illegal activity, and stresses the lengths to which the banking industry will go to ensure that the whistleblower is isolated, degraded and denounced. She goes on to ask a number of searching questions about the silence that surrounds elite criminality. John Christensen reflects on his experiences when he decided to speak out about malpractice in the highly secretive jurisdiction of Jersey, and gives a sober assessment of what whistleblowers can expect from their colleagues, employers, friends, media and judiciary once they stick their heads over the parapet. Kenneth Rijock, both a lawyer and convicted money launderer, gives wouldbe whistleblowers a brief introduction to information security – the techniques that we can use to avoid detection by crooked employers and, ultimately, jail. William Byrnes introduces us to three of the highest profile whistleblowers from the financial sector, and explores the relationship between whistleblowing and tax compliance and highlights the much anticipated legislation of several offshore jurisdictions who are looking to introduce statutory laws to protect whistleblowers who report tax crimes. Download The Whistleblower’s Edition here, and feel free to circulate it to colleagues and friends.